My father was not a traditional man. He had issues with authority and hierarchy. But he was adamant about respect for people in uniform. Police uniform, fire fighter uniform, and especially military uniform. He said “thank you for your service” to all of them. I was born on Fort Devins, in Massachusetts, in 1971. My mother stuck McGovern buttons onto my stroller. She was not on board with the Vietnam war. She was not on board with the military. And she was especially nervous that my dad would go to Vietnam. He did not. He used to say it was because I was born, that I was the reason he didn’t have to go. Now that I am grown up I realize that this was probably not the case. He was just lucky. He was an orthopedic surgeon serving in the army, and he just lucked out. His boss was a man named Michael Goldberg. Dr. Goldberg took care of my brother the day I was born. They kicked a mama cat and her kittens out of the delivery room. And they gave my mother a hard time that her paperwork hadn’t been properly processed. But they let me be born anyway. 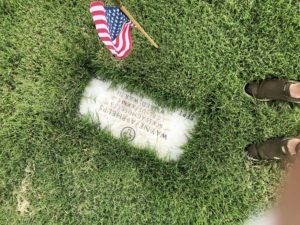 Memorial day was never a thing in my family. But veterans have been a thing in my family. I spent many months of my orthopedic residency taking care of Veterans at the VA Hospital in Houston, Texas. The building was so large that my junior resident used to ride from one end to the other on a skateboard. He got in some trouble for this, but not a lot. There was also an expose on TV at some point, calling out the fact that us residents ran the VA orthopedic service without much help or input from our attending physicians. This was partly true at the VA, but much more accurate of our county hospital at the time. I loved the veterans. They had stories. They had opinions. They did NOT want to be rushed. They needed to connect with me as their doctor. And I could always tell the ones that had seen combat. They were always the most respectful to me. They had a look in their eyes. They wore baseball hats advertising the war they fought in. They sometimes also had pins stuck to these hats. Their stoicism and pride, especially the WWII guys, blew me away. Never ever did one of them question that I was a woman, ask me if I was strong enough to do their surgery, ask when a male boss would be there, or harass me. Some were addicted to medication, some had no homes, some had post traumatic stress disorder, alcoholism, and many medical problems. But none of them belittled me as a woman. One morning I was rounding, and came upon one of my patients 2 days post hip replacement (they stayed in the hospital longer then) on his phone in his hospital room. I heard him say that he had an emergency, he was having chest pain. I asked him who he was talking to. He had called 911. His hospital nurse had not answered his calls. He was not experiencing a heart attack, just some indigestion from his breakfast. My middle daughter, Coco, is 8. She is a Brownie. That comes after Daisy’s and before Girl Scouts. She wears a vest that looks eerily like the one I wore circa 1978. 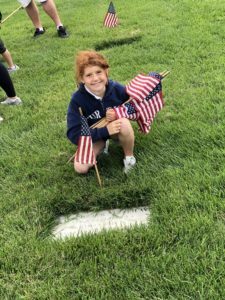 Her brownie troop (well, 4 of the 17) gathered at 7:30 this morning to decorate the gravestones of the veteran’s cemetery with american flags. 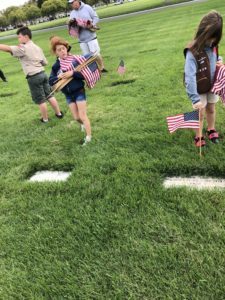 They were supposed to read the name, rank, salute, say “thank you for your service” and place the flag in the grass. I did not expect to be choked up. Actually, I was kind of hung over. I was on call twice this week, short on sleep, and physically tired from operating. Last night I shared a bottle of wine with my mother and sister. As I drove Coco and her friend to the cemetery, the traffic thickened. The crowds were immense. So many boycotts and girl scouts and their families. 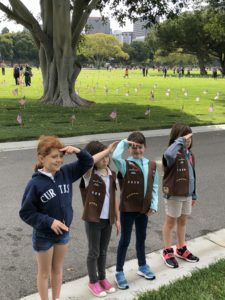 There is no official connection between the military and scouts, but the relationship is just correct. Patriotism. Uniforms. People doing their best to do what they think is right. The swarms of children and adolescents paying their respects to our fallen heroes kind of blew me away. There was particular sorrow when we noticed the double grave markers, those that marked father son pairs. Some were WWI paired with WWII. Some were sons killed in combat paired with fathers who died of old age. We stood in the Vietnam section of the Veteran’s cemetery for a time today, amidst those that gave their lives around the time that my family lived on Fort Devins. In 2018 Dr. Michael Goldberg, the man who was my father’s superior officer when I was born, has become a treasured mentor. He and I work together striving toward physician mental health and wellness. We were “introduced” by the president of the Pediatric Orthopedic Society of North America, tasked with creating a physician wellness platform, and away we have gone. As our work begins, we have sadly found that 39% of our pediatric orthopedic surgery colleagues are burned out. We are worried about them and their patients. 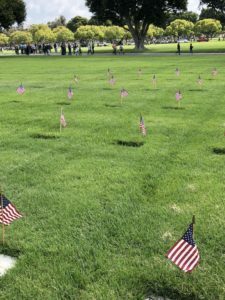 As I think about memorial day, and the strong history of our military in our world of orthopedic surgery, I am humbled by the challenges our Veterans have in terms of mental well being. We have made such great strides to improve the recognition of stress, anxiety, depression, and mental challenges in our Veterans. I am hopeful that we can begin to do the same for our physicians. On this Memorial Day, I intend to pay attention to our fallen heroes. And although Memorial Day is not Veteran’s day, I intend to pay attention to our Veterans struggling with their mental well being. And although Memorial Day is not Physician’s day, I intend to prepare for June 1, which has been declared the day of #crazysocks4docs in awareness of depression, mental well being, and suicide among physicians. Well done! You have made my mdw more meaningful with your insights! Thanks, Barbara! This has always just been a long weekend for us, it was nice to think about it a bit! Sally, thank you for reading! Love you and your family. Thanks for your thoughts before Memorial Day. My is son is army C47 helicopter pilot already with deployments to Afghanistan and to Iraq. I have been fortunate to have had 23 years and retired as colonel usaf. Memorial Day has has special meaning for our family that we are alive while many are not. Rick, your leadership as immediate past president of our Pediatric Orthopedic Society of North America has been humble, graceful, and inspiring. Thank you for all that you do. You represent our Veterans in the best way, and I am proud to call you my mentor and friend. Great stories of your family and the respect for our war dead. All who served gave something; some who served gave everything. In a nation that was born by and is sustained by the blood of patriots. Americans have liberated more people oppressed and under tyrannical evil than all the rest of the world in history. Our soldiers, sailors, marines and airmen want peace more than anyone, but still volunteered. Tomorrow I will honor two of my fallen colleagues of foreign conflict; Major T. J. Gillespie, USA MC, an anesthesiologist who was killed during our deployment in Operations Desert Shield/Desert Storm, and one of my former junior residents Colonel Brian Allgood, USA MC who was lost in Operation Iraqi Freedom. On behalf of a grateful nation, may almighty God rest their souls. David Teuscher, I am honored to know you and learn from you. Thank you for your leadership of our American Association of Orthopedic Surgeons, and for your many years of military leadership. I send you all of my best wishes and prayers on this Memorial Day weekend, and I, too, will honor your fallen friends.